God will make the new earth his dwelling place... Heaven and earth will then no longer be separated as they are now, but they will be one. But to leave the new earth out of consideration when we think of the final state of believers is greatly to impoverish biblical teaching about the life to come. Many books on Heaven speak only of the intermediate state, where Christians go when they die. Often they say nothing about the New Earth, where we’ll live forever as resurrected people. Other books address the New Earth but deny its true nature. As one author puts it, “Is this new earth like our present earth? Probably not.” But if it isn’t, why does God call it a New Earth? This author also says, “The eternal phase of Heaven will be so unlike what we are familiar with that our present language can’t even describe it.” Certainly our present language can’t fully describe it, but it does in fact describe it (e.g., Revelation 21-22). We are homesick for Eden. We’re nostalgic for what is implanted in our hearts. It’s built into us, perhaps even at a genetic level. We long for what the first man and woman once enjoyed—a perfect and beautiful Earth with free and untainted relationships with God, each other, animals, and our environment. Every attempt at human progress has been an attempt to overcome what was lost in the Fall. Our ancestors came from Eden. We are headed toward a New Earth. Meanwhile, we live out our lives on a sin-corrupted Earth, between Eden and the New Earth, but we must never forget that this is not our natural state. Sin and death and suffering and war and poverty are not natural—they are the devastating results of our rebellion against God. We long for a return to Paradise—a perfect world, without the corruption of sin, where God walks with us and talks with us in the cool of the day. Because we’re human beings, we desire something tangible and physical, something that will not fade away. Adam was formed from the dust of the earth, forever establishing our connection to the earth (Genesis 2:7). Just as we are made from the earth, so too we are made for the earth. But, you may object, Jesus said he was going to prepare a place for us and would take us there to live with him forever (John 14:2-3). Yes. But what is that place? Revelation 21 makes it clear—it’s the New Earth. That’s where the New Jerusalem will reside when it comes down out of Heaven. Only then will we be truly home. I heard a radio preacher say, “There’s nothing in our present experience that can suggest to us what Heaven is like.” But if the eternal Heaven will be a New Earth, doesn’t that suggest that the current Earth must be bursting with clues about what Heaven will be like? Scripture gives us images full of hints and implications about Heaven. Put them together, and these jigsaw pieces form a beautiful picture. For example, we’re told that Heaven is a city (Hebrews 11:10; 13:14). When we hear the word city, we shouldn’t scratch our heads and think, “I wonder what that means?” We understand cities. Cities have buildings, culture, art, music, athletics, goods and services, events of all kinds. And, of course, cities have people engaged in activities, gatherings, conversations, commerce, and work. Heaven is also described as a country (Hebrews 11:16). We know about countries. They have territories, rulers, national interests, pride in their identity, and citizens who are both diverse and unified. If we can’t imagine our present Earth without rivers, mountains, trees, and flowers, then why would we try to imagine the New Earth without these features? We wouldn’t expect a non-Earth to have mountains and rivers. But God doesn’t promise us a non-Earth. He promises us a New Earth. If the word Earth means anything, it means that we can expect to find earthly things there—including atmosphere, mountains, water, trees, people, houses—even cities, buildings, and streets. (These familiar features are specifically mentioned in Revelation 21-22). We’re told we’ll have resurrection bodies (1 Corinthians 15:40-44). When God speaks of us having these bodies, do we shrug our shoulders and say, “I can’t imagine what a new body would be like”? No, of course we can imagine it. We know what a body is—we’ve had one all our lives! (And we can remember when ours looked better and worked better, can’t we?) So we can imagine a new body. In Heaven, we’ll rest (Revelation 14:13). We know what it means to rest. And to want to rest (Hebrews 4:10-11). We’re told we will serve Christ on the New Earth, working for his glory (Revelation 22:3). We know what it means to work. And to want to work. Scripture speaks of a New Jerusalem made of precious stones. Some of the jewels listed in Revelation 21:19-21 are among the hardest substances known. They indicate the material solidity of the New Earth. The problem is not that the Bible doesn’t tell us much about Heaven. It’s that we don’t pay attention to what it tells us. Some of the best images of Heaven are in children’s books. Why? Because they depict earthly scenes, with animals and people playing, and joyful activities. The books for adults, on the other hand, often try to be philosophical, profound, ethereal, and otherworldly. But that kind of Heaven is precisely what the Bible doesn’t portray as the place where we’ll live forever. We can only hope for what we desire, and we can only desire what we can imagine. If you think you can’t imagine Heaven—or if you imagine it as something drab and unappealing—you can’t get excited about it. You can’t come with that childlike eagerness to embrace the kingdom that God so highly values (Mark 10:15). Abraham “was looking forward to the city with foundations, whose architect and builder is God” (Hebrews 11:10). If he was looking forward to it, don’t you think he was imagining what it would be like? Abraham’s descendants “were longing for a better country—a heavenly one” (Hebrews 11:16). And, as Christ’s followers, “we do not have an enduring city, but we are looking for the city that is to come” (Hebrews 13:14); “we are looking forward to the new heavens and new earth he has promised” (2 Peter 3:13, NLT). Is the Eternal Heaven an Actual Place? Many people can’t resist spiritualizing what the Bible teaches about Heaven. According to an evangelical theologian, “While heaven is both a place and a state, it is primarily a state.” But what does this mean? A theologian writes, “Paul does not think of heaven as a place, but thinks of it in terms of the presence of God.” But when a person is “present,” doesn’t that suggest there’s a place? One book puts place in quotation marks whenever it uses the word to describe Heaven or Hell. It says Paradise is “a spiritual condition more than a spatial location.” But Jesus didn’t say that Heaven was “primarily a state” or a “spiritual condition.” He spoke of a house with many rooms in which he would prepare a place for us (John 14:2). In Revelation 21-22, the New Earth and New Jerusalem are portrayed as actual places, with detailed physical descriptions. Jesus told the disciples, “I will come back and take you to be with me that you also may be where I am” (John 14:3). He uses ordinary, earthly, spatial terms to describe Heaven. The word “where” refers to a place, a location. Likewise, the phrase “come back and take you” indicates movement and a physical destination. If Heaven isn’t a place, would Jesus have said it was? If we reduce Heaven to something less than or other than a place, we strip Christ’s words of their meaning. Are We Just Passing Through? The old gospel song, “This world is not my home, I’m just a-passing through,” is a half truth. We may pass from the Earth through death, but eventually we’ll be back to live on the restored Earth. Earth has been damaged by our sin (Genesis 3:17). Therefore, the Earth as it is now (under the Curse) is not our home. The world as it was, and as it will be, is our home. We have never known a world without sin, suffering, and death. Yet we yearn for such a life and such a world. When we see a roaring waterfall, beautiful flowers, a wild animal in its native habitat, or the joy in the eyes of our pets when they see us, we sense that this world is—or at least was meant to be—our home. We are pilgrims in this life, not because our home will never be on Earth, but because our eternal home is not currently on Earth. It was and it will be, but it’s not now. Will the Eden we long for return? Will it be occupied by familiar, tangible, physical features and fully embodied people? The Bible clearly answers yes. The biblical doctrine of the New Earth implies something startling: that if we want to know what the ultimate Heaven, our eternal home, will be like, the best place to start is by looking around us. The present Earth is as much a valid reference point for envisioning the New Earth as our present bodies are a valid reference point for envisioning our new bodies. We shouldn’t read into the New Earth anything that’s wrong with this one, but can we not imagine what it would be like to be unhindered by disease and death? Can we not envision natural beauty untainted by destruction? The idea of the New Earth as a physical place isn’t an invention of shortsighted human imagination. Rather, it’s the invention of a transcendent God, who made physical human beings to live on a physical Earth, and who chose to become a man himself on that same Earth. He did this that he might redeem mankind and Earth. Why? In order to glorify himself and enjoy forever the company of men and women in a world he’s made for us. In order to have a biblical worldview, we must have a sense of our past, present, and future, and how they relate to each other. Without understanding God’s original plan for mankind and the earth, we cannot understand his future plan. Without the bookends of past and future in place, the books—our present lives—won’t stand up. The chart “Three Eras of Earth and Mankind” portrays human history and human destiny. It demonstrates the continuity of past, present, and future, and the continuity between life on the old Earth and life on the New Earth. By comparing each series of statements, you’ll see the distinct differences between these three periods. I encourage you to study this chart and contemplate the significance of each phase of Earth’s history. In Genesis 3, the Earth’s first radical transition (mankind’s fall and first judgment) can be seen as one bookend of human history under the fall. In Revelation 20, we see the second bookend in the Earth’s last radical transition (Christ’s return and last judgment), creating a picture of great symmetry. In Genesis, God plants the garden on Earth; in Revelation, he brings down the New Jerusalem, with a garden at its center, to the New Earth. In Eden, there’s no sin, death, or Curse; on the New Earth, there’s no more sin, death, or Curse. In Genesis, the Redeemer is promised; in Revelation, the Redeemer returns. Genesis tells the story of Paradise lost; Revelation tells the story of Paradise regained. In Genesis, humanity’s stewardship is squandered; in Revelation, humanity’s stewardship is triumphant, empowered by the human and divine King Jesus. These parallels are too remarkable to be anything but deliberate. These mirror images demonstrate the perfect symmetry of God’s plan. We live in the in-between time, hearing echoes of Eden and the approaching footfalls of the New Earth. The earth matters, our bodies matter, animals and trees matter, matter matters, because God created them and intends them to manifest his glory. And as we’ll see in the following chapters, the God who created them has not given up on them any more than he has given up on us. Can We Love the Things of This World? Randy Alcorn talks about what he loves in this world and how when we love the good things of this world correctly we are loving the things of God. This video clip was excerpted from Randy's Eternity 101 DVD class. Randy Alcorn talks about how belief or disbelief in another world will change our life in this world. 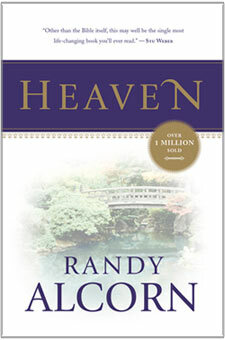 This video clip was excerpted from Randy's Eternity 101 DVD class.